After being thumped 4-0 in the Ashes Test series, England's limited-overs players produced a stunning turnaround to beat the Australians three times in a week, outplaying the home team both when chasing and defending big totals. 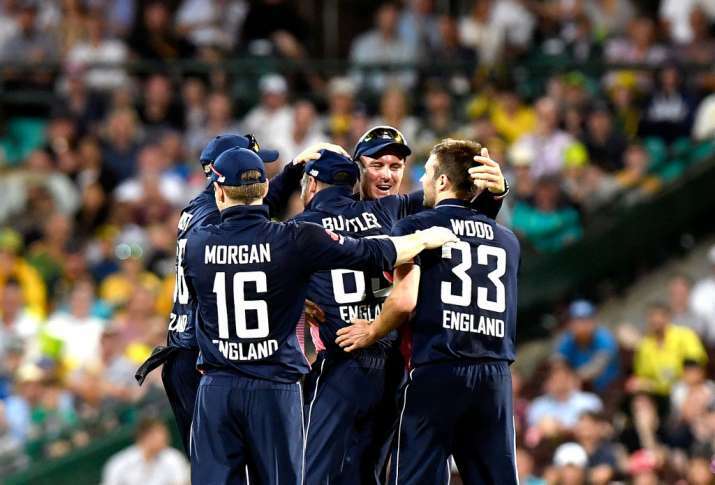 England defeated Australia by 16 runs in the third ODI at the Sydney Cricket Ground Sunday to clinch their five-game series with two games to spare and hand the world champions their first ODI series defeat at home since 2010. After being thumped 4-0 in the Ashes Test series, England's limited-overs players produced a stunning turnaround to beat the Australians three times in a week, outplaying the home team both when chasing and defending big totals. Needing to win Sunday's match to keep the series alive, Australia brought their best fast bowlers together for the first time since the Ashes but it was to no avail as England's middle-order pounded Mitchell Starc, Josh Hazelwood and Pat Cummins at the death to post an imposing total of 302 for six. Jos Buttler hit two runs off the final ball to complete his first ODI century against Australia after sharing an unbroken 113-run partnership with Chris Woakes that proved the difference between the sides. The tourists had looked to be in trouble after slumping to 189-6 in the 39th over but rebounded in spectacular fashion with Buttler belting six boundaries and four sixes to finish 100 not out from just 83 balls, while Woakes chipped in with five fours and cleared the rope twice to remain unbeaten on 53 off only 36 deliveries. The Australians did not help themselves in the field, bowling 13 wides and dropping three catches, including one off Buttler when he was on 70. The Englishman had another scare on 97 when he was given out leg before wicket on the first ball of the last over but the decision was correctly overturned on review after replays showed the ball hit the edge of his bat. Buttler took a single off the next ball and didn't get back on strike until the final delivery, but managed to squeeze Starc's attempted yorker into the legside field and scramble through to reach his hundred, leaping into the air with excitement. Australia's reply began poorly when Dave Warner and Cameron White both went cheaply but Steve Smith's men were thrown an unexpected lifeline when England paceman Liam Plunkett pulled a hamstring in his second over and was forced off the field, leaving the tourists a bowler short. Most of the Australians made starts but none was able to go on and post a big number to match Buttler's electrifying rate. Aaron Finch, who made centuries in each of the first two matches, top scored with 62, while Marcus Stoinis (56) and Mitchell Marsh (55) also made half-centuries after Smith was controversially given out for 45 when caught behind by Buttler although replays were inconclusive as to whether the ball had carried through.